The iOS App Store is not even three years old yet but Apple has already approved 500,000 apps in the USA’s App Store alone. That’s a whole lot of iOS apps for your iPhone and iPad. This is according to 148apps, who created a giant infographic to show off the accomplishment. 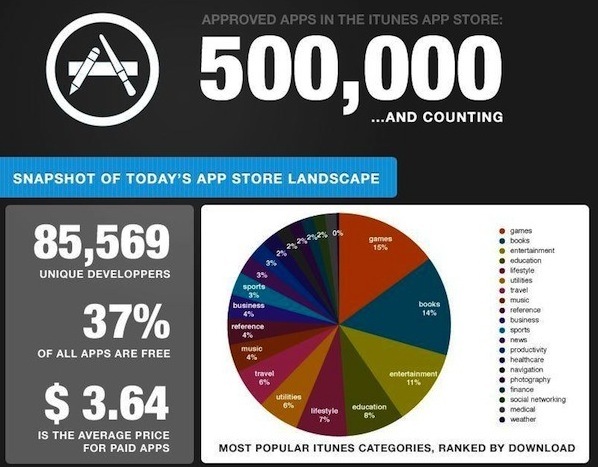 Infographic via 148apps, and individual app store counts via GoogleBlog, Wikipedia. These are huge numbers but really I only use about 15 apps on my iPhone frequently, and maybe another 15 on the iPad. I think this is the same for everyone, plenty of choice but few you really need, and I mean this for all platforms not just iOS. I’ve always wondered why can’t I browse all these apps, not just Top 25, Top Free or Top Paid, this is really stupid, or I am really stupid for not knowing how, which is it?